On Sunday, from 10 a.m. to 6 p.m., Venice is putting on a free festival to showcase the artsy neighborhood’s talent and creativity. Spanning from Main Street to Venice Boulevard, food trucks including Baby’s Badass Burgers, Border Grill Truck, The Dim Sum Truck, Knockout Taco Truck, Dogtown Dogs, South Philly Experience and Cool Haus, and beer gardens from The Brig, Stella Artois and Widmer Brothers Brewing will fill up Abbot Kinney Boulevard. 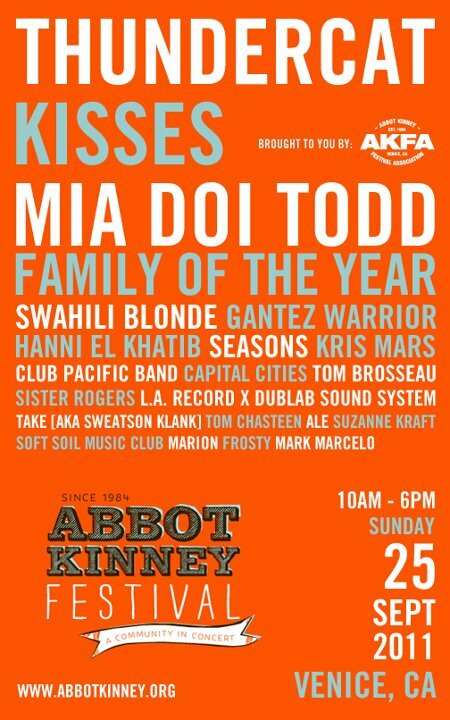 The music lineup looks good too, with performances by Thundercat, Dumbfoundead and Mia Doi Todd, among others.